Presenting this strikingly beautiful Cartier Panthere collection necklace, crafted in 18k white gold and adorned with a total of 3.71 carats of round brilliant cut diamonds. 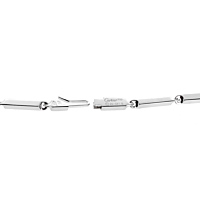 The famous Cartier Panthere centers the necklace by holding on to both ends of this beautiful Cartier necklace. What an entrance!